A short Training Programme designed to teach beekeepers how to remove and relocate unmanaged honeybee colonies. Once a person starts keeping bees and gains confidence in managing a colony of honeybees in a standard beehive he may want to add one or two more beehives to his apiary. Word gets out that he/she is now keeping bees and friends contact him or her because they have a wild colony on their premises which has moved into some cavity and will one day become a nuisance. This course teaches beekeepers how to assess the viability of safely removing a colony of bees and relocating it into a proper beehive where it can be managed in a friendlier environment. 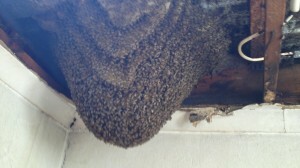 It is not always necessary to exterminate a colony of honeybees if they can be properly and safely relocated. Participants will be taught how to physically relocate a wild colony with minimal disruption to the bees and to the public. Be a Registered Beekeeper with the Department of Agriculture and be in possession of a current Registration Certificate. Saving all the brood out of a birdlog! The course programme comprises one afternoon / evening session discussing the course content above, followed by practical Field Work in removing and relocating colonies of bees into beehives. 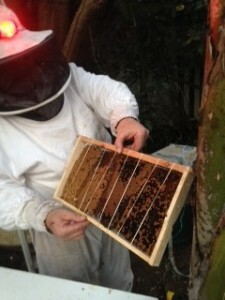 Ideally each delegate should have completed two bee removals with the group or facilitator as a completed programme. The colonies to be removed shall be sourced either by the facilitator or delegates might have their own sources which they will want to keep as their own. Each course will be restricted to a maximum of four delegates. Courses are run dependent on delegate numbers from time to time. Once there are sufficient delegates the course will be scheduled to accommodate all delegates and the facilitator. Cost of the Course: R600 per delegate. 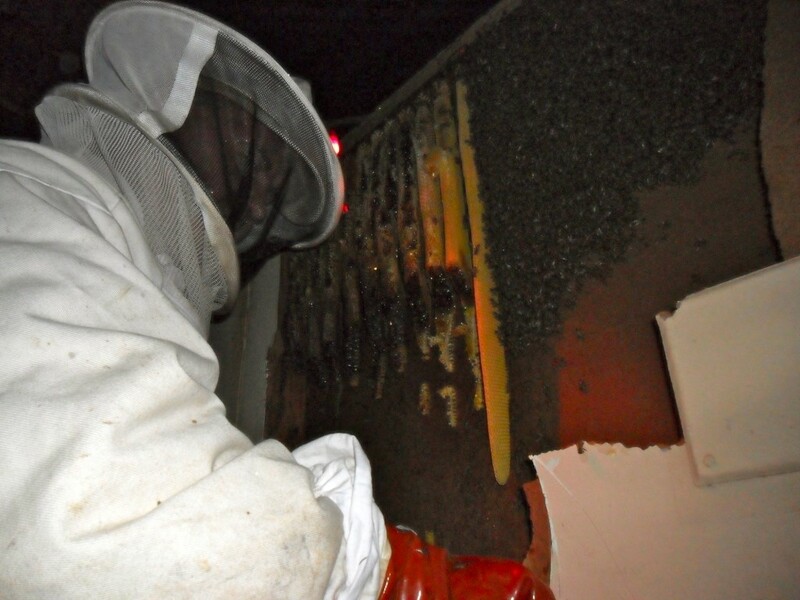 The facilitator reserves the right to levy a fee for any bee removals carried out as part of the training from the landowner requesting the bee removal. KINDLY TAKE NOTE THAT THIS COURSE IS NOT DESIGNED TO ENABLE PERSONS TO BECOME PROFESSIONAL BEE REMOVAL SERVICE PROVIDERS AT THE EXPENSE OF THE HONEYBEES’ BIODIVERSITY. IT IS ONLY INTENDED FOR BEEKEEPERS WANTING TO PRESERVE THE FUTURE OF THE HONEYBEE AND ADD AN EXTRA SKILL TO THEIR BEEKEEPING INTERESTS. Removing Bees from behind a pre-fabricated wall – patience & expertise! !